Jordan grew up in Kitchener, Ontario and moved to Toronto when he was 14. His main sports growing up were soccer, tennis and basketball. Jordan excelled in these sports and his passion for fitness carried forward into his adult life. As Jordan puts it, “sports allow him to satisfy his inner self.” He is doing what he loves to do – compete in sports and be athletic while curing himself from Crohn’s Disease – more on that later. Jordan operates a Consumer Empowerment website called www.wenegotiateforyou.ca helping people save money in four key areas: Buying a car, buying or selling their house, renewing their mortgage and financial advice. He lives in Oakville, Ontario, with his finance Annie, their two girls, his son Jackson and Buddy, his Golden Retriever. Jordan loves motorcycles, painting, juggling, magic tricks and can be found napping in the yard on weekends. When did you first start working out? What adversity have you had to overcome? In order to properly deal with my disease I had to learn to eat differently. I went on a high protein, high fat and zero carbohydrates diet during the week and a high carbohydrate diet on weekends. I eliminated alcohol and coffee. I also learned to reduce my stress levels, which was aided by ending a disruptive marriage. My last Chrohn’s attack was at age 34. In my opinion, this can be attributed to my new eating habits, the elimination of coffee and alcohol, reduced stress levels and vigorous exercise. My results and methodology may seem outside the norm, but I remained committed to a holistic approach to dealing with Chrohn’s and eradicating the pains and attacks associated with the disease. I lost 35 lbs and have kept it off. I have never been in better shape. Motivation is a key element for me and I’ve stayed on track by setting numerous long term fitness goals. I’ve gone after these goals with passion and conviction. This has resulted in me running multiple marathons and triathlons, playing semi pro baseball, I’ve set track meet records in the 400 meter, 600 meter and 800 meter. 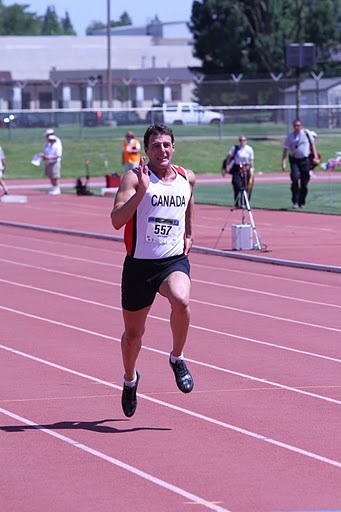 I also placed 4th in the world for Decathlon in 2011 (Men aged 40 to 44). My most recent fitness accomplishment was last summer, I crossed Lake Ontario (51 km) on a Stand Up Paddle Board in 8 hrs and 15 minutes. I train five to six days a week for a minimum of one hour, sometimes two. I train hard and with purpose because I have very specific goals. I also work with a training coach for maximum results (www.myremotecoach.com). Set a BIG Goal, something that makes your palms sweat and heart beat faster just thinking about it. Then set smaller goals that are aligned to your larger goal. Work with a coach or a group. Doing so will maximize your results and increase the likelihood of achieving personal excellence.